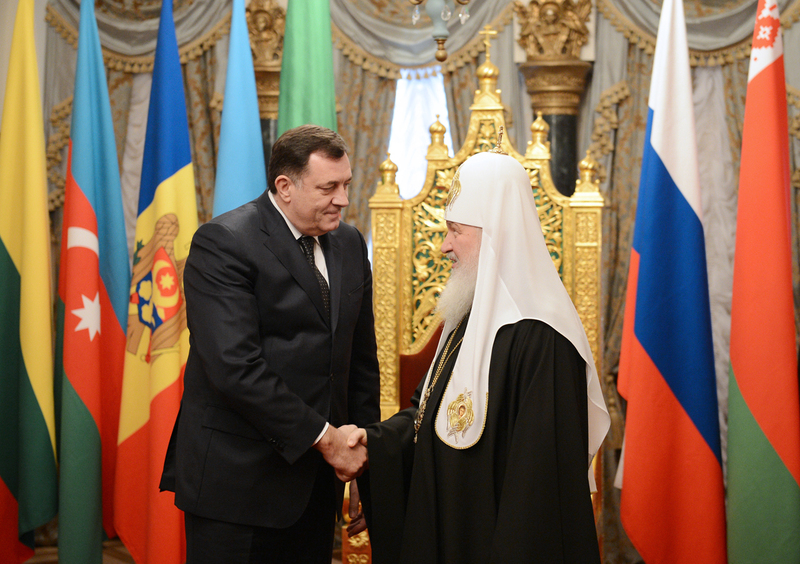 On March 11, 2014, His Holiness Patriarch Kirill of Moscow and All Russia met with Mr. Milorad Dodik, President of the Republika Srpska (Bosnia and Herzegovina) at the patriarchal chambers of the Church of Christ the Saviour. The meeting took place in anticipation of the 2013 Alexy II Prize award ceremony “For the outstanding work for consolidation of the unity of Orthodox nations and promotion of Christian values in the life of society”. Mr. Dodik was a winner of this prize established by the Unity of Orthodox Nations International Foundation. Welcoming the guest, Patriarch Kirill said, “We are glad that it is you who have become a winner of this prize this year. We are well aware of your stand in life: you are an Orthodox man and as President of the Republika Srpska, you have given great attention to the restoration of churches and support for the Orthodox Church. We are aware of your concern for the Serbian people who live in the state of which Republika Srpska is a part and of the honesty and integrity with which you advocate the interests of your Orthodox people”. His Holiness Kirill stated that the Republika Srpska is the most prosperous part of Bosnia-Herzegovina. “This shows that the Serbian people are industrious and gifted and they know how to work even in a difficult situation, producing all that is necessary for their life”. He shared the memory of his visit to the republic at the time of war, “I remember my meetings with the leaders of the Republika Srpska at that time and the difficulties we had to overcome to reach Sarajevo. We saw with our own eyes all that the war brought to that land, and we are glad that today the Republika Srpska lives in peace and prosperity. May God let it continue”. Mr. Dodik, on his part, expressed gratitude for having been awarded such an authoritative international prize. “We are very grateful for the support you give to the Serbian people and Republika Srpska. The Russian people and the Russian State are the greatest friend and partner of the Serbian people. Such was the case in both the past and the present”, he said. The president also stressed the importance of spiritual unity between the Russian and Serbian people and the spiritual revival they are experiencing after decades of official atheism. He also spoke of the feat of martyrdom and confession performed by both the Russian and Serbian Orthodox Churches. “The Orthodox Church is very important for the national identity of the Serbian people and the Republika Srpska”, he said, attesting to the respect and support for the Church given by the Republika Srpska authorities and conveying best regards from the hierarchs of the Serbian Patriarchate who serve in the republic: Bishop Efrem of Banja Luka and Bishop Gregory of Zahumlje and Herzegovina.